Previously I wrote a post about Starbucks coffee prices and how coffee purchases can be brewing a hole in your wallet. Ironically I don’t even drink coffee. Instead I mostly only drink tap water and it adds up to huge savings. Back when I was younger I was big on soccer and several other sports. I wasn’t a standout athlete or anything, but I really enjoyed both playing and watching sports. Some of my friends were more serious about the fitness side of things. One of them was advised that he should cut pop and other sugary drinks out of his diet. Since I was such a sugar fiend, I was reluctant to follow suit. At the time I didn’t realize that most of that sugar would just get converted into fat. Later in college as I grew less active, I decided to try to improve my diet a bit and make a conscious effort to drink more water. Ever since then, I’ve maintained the habit. So what started as a health decision, also turned into a good way to save money. Because a typical beverage only costs a dollar or two, it is easy enough to overlook the expense. When you add up those little purchases through the year, it really adds up to a decent amount of money. If you go out to a restaurant, they often jack up the price of the drinks to sneak in some extra profit. That is one place that I am still guilty of overpaying to quench my thirst. Lately I’ve been switching to water as I just don’t feel right paying $3 for a glass of iced tea. In grocery stores the price of beverages has increased too. I used to save some money by getting frozen juice instead of cartons, but it’s tougher to justify with the rising costs. You can still get pop for fairly cheap, but as a very unhealthy option I’ve been avoiding that. Switching to tea is a great way to enjoy a refreshing beverage while saving money. Ordering leaves in bulk from a tea manufacturer like Buddha Teas will save you a surprisingly large amount of cash over time; you can even choose from a number of different flavors, such as red raspberry leaf as well as green tea, bark, flower, root, and much more. Tea is less expensive and healthier than most soft drinks. The health benefits of tea make it an excellent investment that will save you money while potentially adding years to your life. The one exception I do make is pop or juice for alcoholic drinks. Since that is a treat and not a daily consumption, I don’t feel too guilty about it. So if you are looking to cut some sugar out of your diet, look first to what you’re drinking. It can improve your health and save money. Keeping it up is just a matter of getting in the habit and acknowledging the high cost and unhealthy nature of processed drinks. Are any of your primarily tap water drinkers? Or are there any other things that you do to save money on drinks? We live in a hot and humid climate so it’s almost mandatory that we drink water constantly. Unfortunately the tap water here isn’t drinkable so we are forced to buy our water, but it’s still pretty cheap. We have a water cooler that does both hot and cold water and we spend $4 a week on the water to dispense from it. Best of all I’ve dropped about 20 pounds since moving here and I’m sure some of that is due to the switch in beverages. Yeah $4/week is not bad at all. Over here that is maybe 2 liters of bottled water. I’m sure the change in beverages did play a big part in the weight you lost. I drink a lot of tap water. I actually like water and of course it’s super refreshing, so I’m happy. The fact that it’s tasty and refreshing does make it an easier habit to maintain. In NYC they say our tap water is tops in the world… who knows. But I grew up on the tap and still drink it. I totally agree that it has a ton of benefits to your waist line and your wallet. Good stuff. I’m sure a huge city like NYC would have extremely high tap water standards. Whether it really is tops in the world is tough to prove though. So I expect many big cities make such claims. I drink exclusively tap water (though I filter it when possible). I gave up my remaining beverages (milk, juice, occasional mixed alcoholic drinks) over a year ago for exactly the reason you mentioned – the sugar! I was on a very strict low-sugar diet and would rather eat than drink my small sugar allotment. Even though I’ve loosened up on my diet thankfully the water-only habit has stuck, to the benefit of my health and wallet. Tap water is my primary refreshment. Not only is the ultimate hydrater, but it saves huge money over any other drink! Yes, if you want to save money on drinks, you can’t beat the price of water. I prefer water to anything else as well. It is true that sugar causes us to gain weight. Last June I cut sugar out of my diet and lost 30 pounds. I don’t even care for the sugar free pops. BTW – Good luck this week with your move! Wow congrats on the big weight loss. A lot of people just don’t realize that sugars can contribute to weight gain just as much as fatty foods. Thanks for wishing me luck with the move. It has kept me extremely busy lately which is why this post is a bit below my normal standards. It’s hard to cut out all sugary drinks and just stick to water – so congrats on doing that! About a year ago, I cut out soda and I rarely have one now. However, I do still have a couple energy drinks a week and I do tend to drink coffee/tea drinks when I go out for food. I’m still working on cutting back on this and I agree – the more water, the better! It definitely is an adjustment at first. I don’t know if I will be able to stick to water exclusively, but cutting back as much as possible is a good idea. I used to drink soda growing up. Nothing else. Now that I am older, I mainly stick to water. I’ve found that it is the only thing that quenches my thirst. Anything else just makes me that much more thirsty. Yes that is usually when the habit forms, back when you are younger and not educated enough about sugars. One of the best weight loss tips there is is to not take in any calories from beverages. That means pretty well only water and plain tea (green tea is the best for the waist line). I used to drink lots of bottled water, but I am now fine with tap water. I still have 100% fruit juice sometimes because I love the taste, it’s fairly healthy. Of course I only buy it if the price is right, which means dirt cheap. I try not to drink any calories because I would rather treat myself with a great tasting food, but I like a cold beer as much as the next guy. Hmm, I’ll have to try mixing in some green tea when I feel like something different. It is interesting how some people ignore what they drink when they are trying to lose weight. You can usually get some really good deals on 2 30 packs water bottle for like 10 bucks at ShopRite. I used to drink tap water right out of the faucet but not anymore. For sure, if you watch out for deals, you can get bottled water for extremely low prices. I am fine with just tap water as its easier and doesn’t produce a bunch of waste. 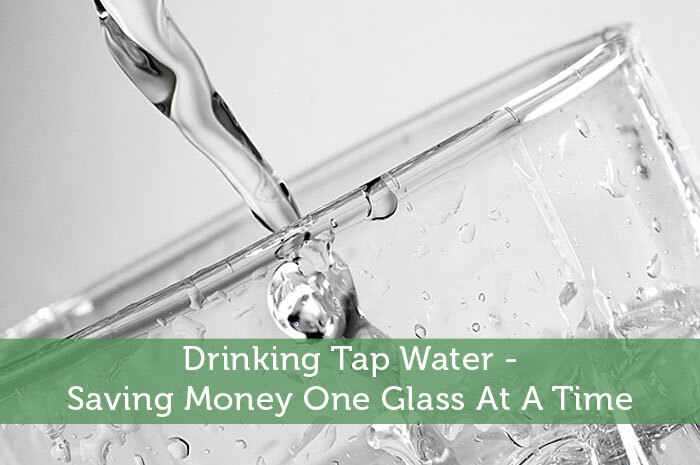 Not only does drinking tap water save yu money, it is good for your body. A few years ago, I stopped drinking sodas with my lunch and I’m down to about one per week. My acne cleared up, blemishes disappeared and my skin is radiant, clean and smooth. Yep, it’s a win-win situation. All the sugar in soda does all kinds of bad things to your body. Awesome tip! Added to my master list post (with the other one). Thanks John! Keep up the great work on your blog. I am moving to high desert so I have been trying to get myself to cut the soda and start drinking water more. It is one seriously tough thing to do, I think quitting smoking made it a bit harder as I went to sweet things like soda and candies to get past the addiction and now its my new quitting addiction. Great article. I think quitting smoking is important enough that you want to give it your all even if it means indulging in more sweets. Then maybe once that is more under control you can try to tackle the next issue.